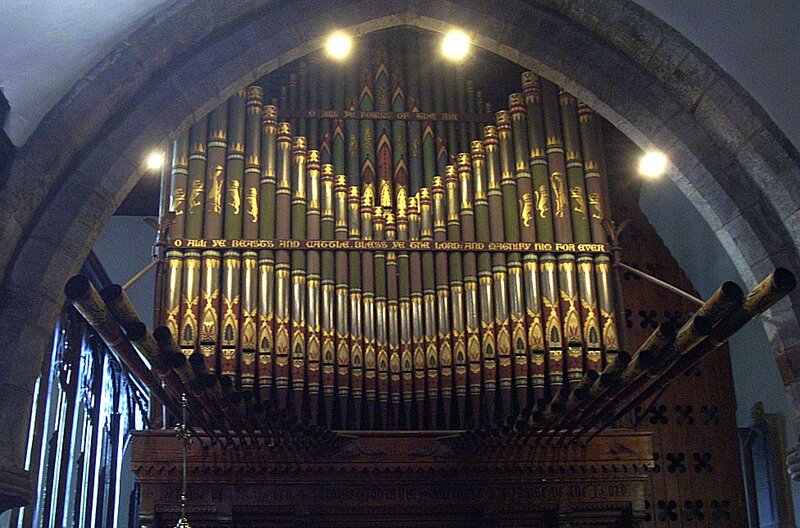 This organ was visited by BOA members during our "organ crawl" to South Wales in September 2012. More recently, last April, our president Paul Carr gave a recital here. 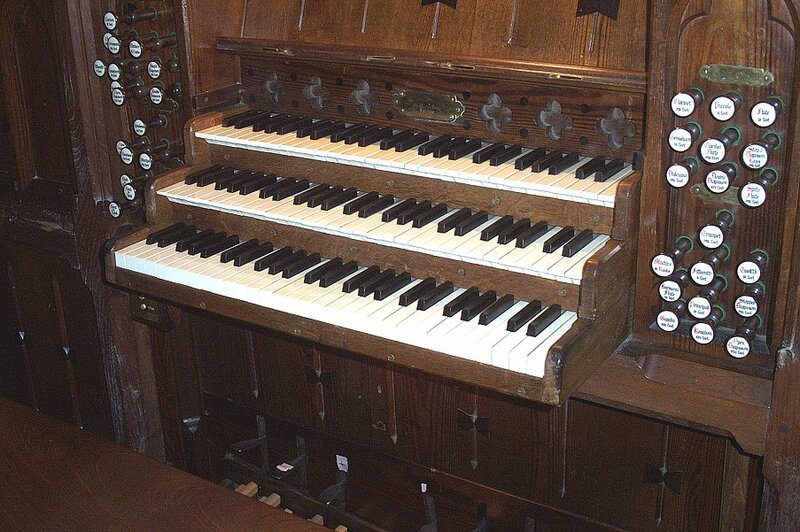 Awarded a Historic Organ Certificate in 1997, this instrument was built in 1861 by Gray & Davison for Llandaff Cathedral (to a scheme devised by Sir Frederick Gore Ouseley), and was moved here from the cathedral in 1900. It received attention in 1966 from Rushworth & Dreaper, including a new balanced Swell pedal and a radiating, concave pedalboard; but in 2005, Nicholson undertook a restoration to its original condition, reinstating a straight pedalboard and lever-operated Swell pedal. The church has a rich history going back to early Norman times, from when the tower had its origin. A Benedictine Priory was established here in c1160. The fine 15th century rood screen was refurbished and painted in 1877. 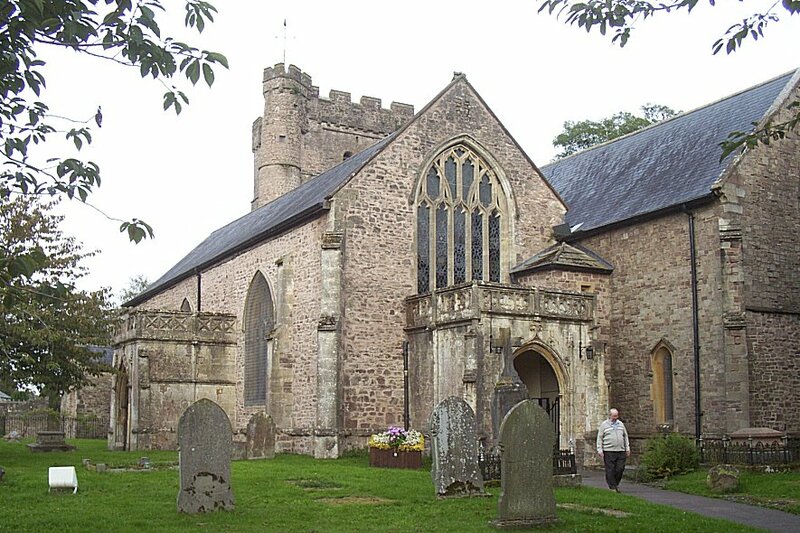 On its eastern side is a brass memorial (thought to be the earliest brass inscription in Welsh) to Adam of Usk, a priest and benefactor of St Mary's, who died in 1420. The organ occupies the north side of the chancel, with its array of en chamade Trumpet pipes projecting aggressively above the console (see central photo). It is a rare unmolested example of G&D's work.